I was cleaning out my makeup stash the past few weeks and took a look at what I was using and what I haven’t touched in years. I got to some items that were easy to toss or giveaway and some were harder. I realized that there were a select few items in my collection that I didn’t know how I would do my makeup without them. Today I thought I would share them with you! While a lot of these will end up in my yearly favorites (or already have,) sometimes it’s nice to revisit those products that always work. Hey everyone! I’m away for the weekend and forgot my laptop, so I’m blogging from my phone! It’s strange and I don’t like it. 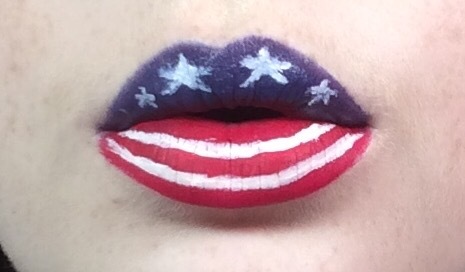 Anyway, I have this fun 4th of July lip art I wanted to share with you all in time for your barbecues. This was fun to create! Not sure how practical this is, but it sure will turn heads. While cleaning my room I found a Macy’s gift card and decided to get myself a few things! I also had some Back to MAC products and got myself a lipglass!